Cataracts are part of the natural aging process. A cataract is a clouding of the natural lens of the eye. Situated just behind the iris and pupil, the natural lens is responsible for helping to focus light and provide clear vision. As we age, the lens of our eye progressively changes, becoming dense and cloudy. As a result, the light that enters the eye can become scattered or poorly focused. Eventually, this leads to blurry vision that affects the person’s ability to see clearly and function effectively. CATARACT TREATMENT: WHEN IS THE RIGHT TIME TO HAVE SURGERY? The good news is that cataracts are very treatable. 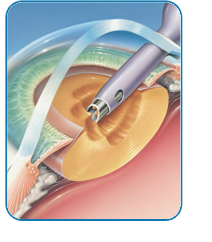 The only long-term, permanent treatment for a cataract is surgical intervention. Cataract surgery is the most commonly performed procedure in the United States. Anywhere from 3 to 4 million procedures are performed each year. Cataract removal is the safest and most predictable surgery performed on the human body today. Cataract surgery is a successful and effective way of restoring your vision. Many people delay having cataract surgery until their vision has significantly deteriorated. While mild effects of cataracts can be temporarily alleviated by prescribing glasses, stronger bifocals, or other visual aids, your vision will continue to worsen over time, leaving surgery as the only option to restore your clear vision. If your vision is prohibiting or impairing your ability to perform normal daily living activities, such as driving, reading, sewing, reading your watch / cell phone, or watching television, then it may be time to consider cataract surgery. In most cases, removing a cataract leads to improved vision. However, other eye conditions may affect your visual outcome after surgery. Deciding when to have cataract surgery is a personal decision. In order to determine the proper timing of surgery and have a complete understanding of the potential benefits and outcome, a comprehensive eye examination and evaluation is required. Your eyes are one of your most valuable assets, so choosing a cataract surgeon is a serious decision. Not only should your doctor be board-certified, trained, and experienced in cataract surgery, he or she should also be compassionate towards your specific visual needs and goals. This ensures that your cataract surgery experience is both successful and comfortable. Dr. Binoy R. Jani of Vista Eye Care Specialists is one of the most trusted cataract surgeons serving Fredericksburg, Culpeper, and the surrounding area. He understands that no two cataract patients are the same so he dedicates the time needed with each patient to thoroughly understand their concerns and goals. Combining his advanced training and skill with the most proven and effective technology, Dr. Jani is able to provide superior results for each individual patient. Dr. Jani has performed thousands of successful cataract surgeries and has the expertise needed to help guide you through the process of reclaiming your sight from cataracts. Dr. Jani removes cataracts using micro-incision surgery and/or laser-assisted cataract surgery, which involves making a tiny incision in the eye, so that a slim probe can be used to remove the cataract with ultrasound energy. Using ultrasound, through a process called phacoemulsification, the cataract is dissolved, after which it is gently vacuumed from the eye. Once the cataract is surgically removed from the eye, a clear artificial intraocular lens (IOL) used to restore clear vision is inserted through the small incision. Assuming the eye is healthy, the patient can expect a painless procedure that usually takes minutes to perform, with a relatively short recovery time, and much improved post-operative vision once the eye has completely healed. This procedure is done one eye at a time, with one eye commonly being operated on one to two weeks after the other. The procedure is performed on an outpatient basis and the patient is usually back to most activities the next day. There have been many exciting innovations in cataract surgery including advanced surgical techniques, laser-assisted cataract surgery (FEMTO), and new and improved intraocular lens implants (IOLs). These advances have resulted in faster healing times and better vision after surgery. One of the latest advances in cataract surgery is a new generation of lifestyle premium IOLs that provide vision for distance, near, and in-between. Prior to multifocal, extended depth of focus (EDOF), and accommodative implants, most patients required reading glasses or bifocals after cataract surgery. The lifestyle premium IOL implants used by Dr. Jani are ReSTOR®, Tecnis, Symfony, Toric, and Crystalens®. After lifestyle premium cataract surgery (surgery that replaces the eye’s natural lens with a lifestyle premium IOL) most patients generally do not require glasses for most activities. Another premium lens technology called the toric lens reduces or eliminates astigmatism, thereby reducing or eliminating the need for glasses at a distance. Ideal candidates for premium cataract surgery are individuals who have active lifestyles and wish to eliminate their dependency on glasses. Premium IOLs can allow patients to see clearly at multiple distances and make activities like reading, driving and seeing at night easier. Read more about premium IOLs in Cataract Technology. One of the most exciting advances in cataract surgery is the addition of femtosecond laser technology. Laser-assisted cataract surgery replaces handheld surgical instruments with a femtosecond laser to break up and remove the cataract. First, Dr. Jani creates a detailed map of your eye using optical coherence tomography (OCT). The measurements captured by the map are used to calibrate a femtosecond laser, which will create a small and precise incision on the eye to access the natural lens. The laser is then used to soften the lens, breaking it up in smaller pieces for easy removal. Once the lens is removed, Dr. Jani will place the artificial IOL. The use of the laser also allows for better positioning of the artificial IOL, better positioning of astigmatism correction leading to better visual outcomes. Candidacy for laser-assisted cataract surgery is determined on a case-by-case basis. Dr. Jani will meet with you to examine your eyes and discuss the benefits and limitations of both traditional and laser-assisted cataract surgery. Recovery time from cataract surgery typically varies with each patient. Since cataract surgery is an outpatient procedure, you will go home the same day as your surgery, with complete healing taking place over the next several weeks. Dr. Jani will prescribe eye drops and a protective eye shield for your eyes to keep them safe from harm in the days following the procedure. Typically vision is noticeably improved by the next day and continues to improve for several weeks. When performed by an experienced board-certified cataract surgeon, cataract surgery is very successful. However, as with any surgery, there is a chance of complications. These complications include pain, infection, swelling and bleeding. Dr. Jani is proud to have a low complication rate when it comes to cataract surgery. He takes every precaution possible to ensure the patient’s safety. Dr. Jani and his team will meet with you several times after your surgery, in order to ensure that you are healing properly. If a complication is detected, Dr. Jani will address it promptly. For frequently asked questions regarding cataract, please see the Cataract FAQs section. Dr. Jani is a fellowship trained cornea surgeon who has performed thousands of cataract surgeries. Please contact Vista Eye for more information on cataracts, or to schedule an appointment for evaluation of your cataract by calling toll free (888) 393-5264.